After our On the Table interview, Chef Sau del Rosario informed us that he was consulting on an upscale restaurant called Madison Grill at the Ayala Trinoma Mall in Quezon City. Wanting to erase the unhappy memory of my last food trip to Trinoma, I decide that I would drop by and have a meal. From its name, the restaurant primarily focuses on their grilled items like the Wagyu and Angus beef steaks, Australian lamb chops and Japanese Kurobuta pork. But what intrigues guests are the open pizza station and traditional pizza oven within the restaurant’s dining area. Giving diners a bit of a show as their pizzas are assembled and baked before their eyes (and watering mouths). 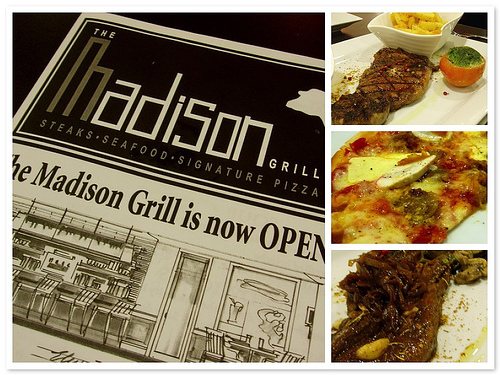 Until Mariko and Stich get a chance to visit, I won’t go into detail about our meal at Madison. I will warn you that it is pricey. But I think it’s worth of try and possibly even a return visit. Many thanks to our server, Ryan. Good service should always be acknowledged. Is Tim Ho Wan Worth the Wait?